Kingbirds (genus Tyrannus from "tyrant") are vocal and fearless birds that aggressively defend their breeding territories, even chasing away much larger birds of prey, dogs, cats and humans. They prefer semi-open or open areas; where they are often observed perching on an exposed branch with a large visibility range as it searches for flying insects to catch mid-air. They have long pointed wings and large broad bills. 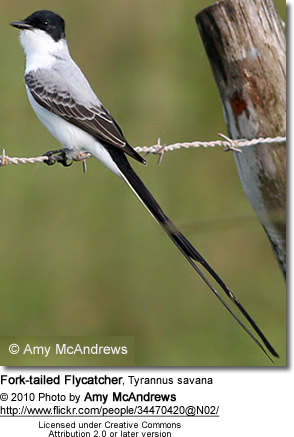 Kingbirds mostly feed on insects, such as bees, wasps, beetles and dragonflies. They also eat small lizards. Depending on the season and availability, small fruits and berries make up as much as one fifth of their daily diet.